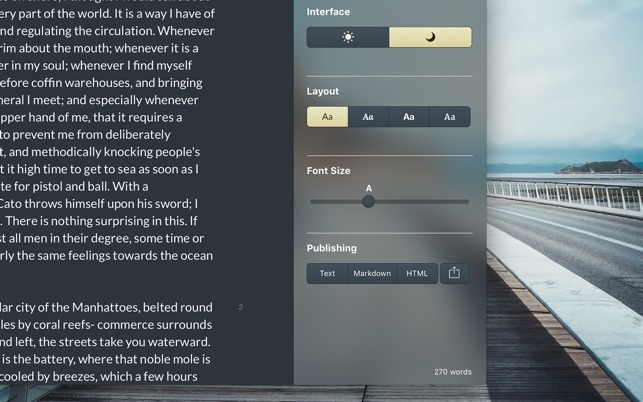 Paragraphs lets you focus on what you do best: write. No distracting menus, no complicated formatting options. It's just you and whatever you feel like writing. - A distraction free writing environment. Once you begin typing the interface disappears and you can focus on what counts: whatever's on your mind. - A quick formatting toolbar that's there when you need it and gets out of your way when you don't. Just highlight some text and you're good to go. 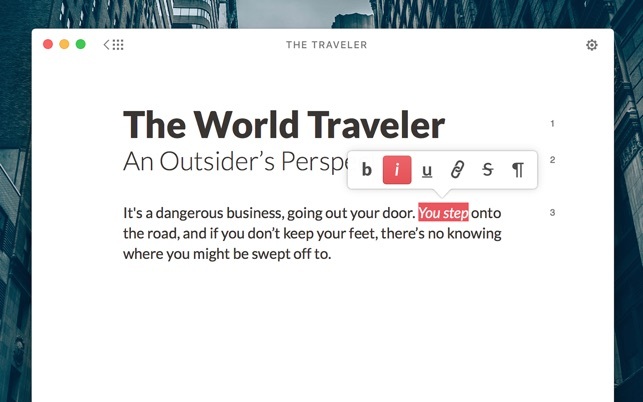 - An overview screen that makes it easy to switch between your writings. - Just enough settings. 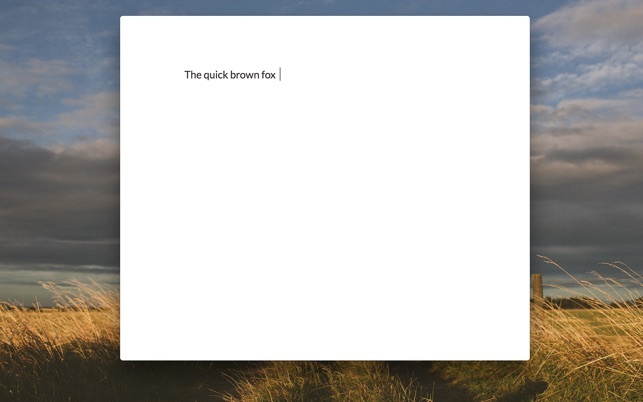 Select from 4 layout and font options optimized for writing. Or switch to dark mode for writing at night or a low light setting. - Easily export to markdown, html, or plain text. - Paragraphs isn't a word processor or desktop publishing application. It doesn't have tools for creating complicated layouts, and only has formatting options that are absolutely necessary for pure writing. Paragraphs provides an ideal environment for getting your ideas on "paper" and can work well along side a page layout application for formatting your finished work. - Paragraphs doesn't natively edit markdown files (although it can export to markdown.) Paragraphs is a rich text editor. What you see is what you get! I sense from other user reviews and the developers’ response that they have already done about all they intend to do with this app. Simplicity is nice, and I even prefer it, but many user suggestions have just been reasonable tweaks to make that simplicity work even better. My two irritants are: As you add new documents, the wall of existing documents keeps expanding and soon you are scrolling down to find the latest created, or, most inconveniently, to click on the new-document blank icon to open a new one. At the very least, allow us to choose the default as new and newer at the top. Nor would it take away from the Simplicity mission to let us slide notes into stacks or subfolders to organize them a bit. Oh yeah, it would also be really nice if we could turn off the automatic insertion of “inspiring” quotes onto brand-new documents upon opening. Personally I find that cluttering, not simplifying. Nice potential, but not much promise for it to be developed. Thanks for the feedback! You can turnoff quotes in the menu by clicking View > Hide Quotes in Editor. Also, hitting the + button on the left of the menu will create a new document and take you directly to it. I had originally given this ap 5 stars because I really liked the feel of writing in it, in its dark mode. But after using it more and more, I’ve downgraded to 1 star. It doesn’t seem possible to have two paragraphs docs open at the same time. So you are always having to go back to its increasingly annoying “overview” page. There doesn’t seem to be a folder/file organization option, so if you have a lot of docs, you have to wade through the highly inefficient “overview page.” I can’t find the docs in iCloud, which means they are hidden from me, which means I have to put 100% faith in the app not to lose anything. And there seems to be something buggy about iCloud not recognizing it, but still storing docs. As I look back over prior reviews, these have been problems for others, with numerous requests to fix them. I will change my review if the authors can fix these problems, because I love the feel of writing in Paragraphs, but as I soon found out, with even the most simple of apps, there’s more to a good user experience than a pretty face. Sorry to hear that. You'll be glad to know that we've addressed most of the major stability issues that users reported in old reviews a while ago. Paragraphs is designed to be a simple app for distraction-free writing and note taking and all of the design decisions we've made are centered around that goal. 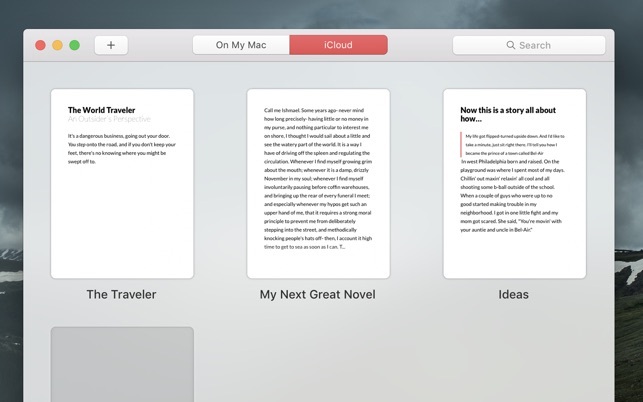 The Overview page is a simple list of your documents that works very similarly to other note-taking apps. Paragraphs was intended from the start to be a single window application, and that probably isn't going to change. When we created the app we thought it would be hard to have a distraction free writing experience when you're trying to juggle 20 open windows at once. We know that Paragraphs won't be a good fit for everyone, but for those looking for a simple way to jot down their thoughts on (digital) paper without the interface getting in the way, we hope Paragraphs is the right app for the job. I’ve tried just about every writing application in the app store, and Paragraphs is by far my favorite, though it isn’t without a few flaws. I’ve chosen to leave a 5 star review, however, as I think the app has great potential and I would love to see it grow. -Geared for writers. Most of the newer ‘apps for writers’ in the app store force users to write in Markdown. While I understand that many people love Markdown, there is a significant number of writers, myself included, that would rather hit command-b than insert a set of unsightly hashtags in the middle of my document. I want to write in a clean workpace, not spend time learning a new command language which adds eyesores to said environment. Paragraph seems to be the only modern writing application that understands this mentality. -Being able to immediately jump back to the overview page with a keyboard shortcut is great. -Overview page is very clean. I really enjoy its simplicity, though a function to sort documents by name and/or date created would be useful. -Slight lack of keyboard shortcut support. It would be great if we users could navigate the overview page, summon the settings panel, and toggle light/dark mode with keyboard shortcuts. -Bugs. I’ve experienced various visual artifcats while using the program, but nothing too serious. I sent the developers an in-depth list of everything I run into on a regular basis. Hopefully they are able to address these at some point. In closing, this truly is a wonderful app for people who just want to get their thoughts down on paper. That said, a bit more polish and functionality would make the application perfect for a lot of users. Hope this review is beneficial for the developers and potential buyers!